Glasgow alt-folk singer-songwriter, Beerjacket has announced his most ambitious project to date – an album and corresponding book Silver Cords. Listen to the first track, “Cord” here. The first track to be taken from the project, Silver Cords is, “Cord” which we are premiering a stream of here on Netsounds and read the accompanying short story, Shoots Of Life below. Beerjacket is the acclaimed DIY solo project of Glasgow based Peter Kelly who has released five albums to date. For Silver Cords he wanted to release something truly special – something physical that won’t be cast adrift on a shelf in favour of its digital imprint. 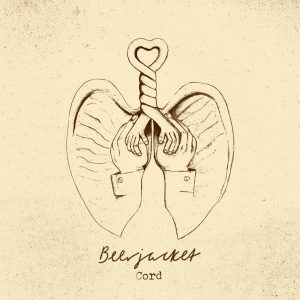 Lead single “Cord” is refreshing in its simplistic truth. The accompanying short story, Shoots of Life, focuses on that one connection in your life that holds everything together. The cord that connects everything. Lead single, “Cord” will be released digitally on 7th September 2018 via Scottish Fiction Records. Pre-order the book/CD Silver Cords at Scottish Fiction. To mark the release, Beerjacket and Scottish Fiction will be launching Silver Cords at King Tut’s Wah Wah Hut in Glasgow on Friday, 23rd November & at Sneaky Pete’s in Edinburgh on Sunday, 25th November. Tickets and bundles are available from scottishfiction.bigcartel.com now. My wife powers our marriage and, for that matter, every tiny piece of engineering that makes our world together work. Children’s meals and clothes, bills, repairs to the house: everything. Without her as the conductor, my orchestra would play flat and out of time, probably performing several different tunes at once before smashing their instruments over each others’ heads. She ensures that all parts of our lives synchronise in a harmonious and beautiful symphony. Each moment she lives is a monument to her organisation and control. I see her at work, plotting and planning to resolve minor and major disasters before they find a means to occur. It is as if she has a clairvoyant ability which enables her to foresee the future and then tweak it to make it right. This is not a claim I could make for myself. My part is always as the director of calamity, or at the very least, a strong supporting lead adding to the drama of every situation. She is calm in the face of challenge while I’m the storm that interrupts the picnic. But we are two corresponding jigsaw pieces. Without the bonds that make the stories of our lives, we might as well be random atoms chaotically appearing and disappearing in space and time like briefly twinkling Christmas lights, disappointing fireworks or increasingly ominous birthday candles. I’ve always believed that as people, the threads that tie us together don’t just connect us to each other, they connect us to ourselves and define the ‘selves’ that we claim as ours. The decisions we make are seldom made alone and we are seldom alone, even on our own. We aren’t who we are, we’re who we are together. Nothing in life is accidental. Everything falls perfectly into place, even when things seem wrong and perhaps especially then. There’s a comfort in accepting that everything good or bad is meant to be, just as it happens. Everything is connected and everything has a purpose, even the things that appear not to work properly. Maybe their purpose is to not work properly. Maybe the things that don’t work properly exist to allow the things that do to fix them. She had assigned me the task of clearing out the old cobwebs that dressed the windows of the shed like tinsel. I’ve always respected and feared spiders. They carry themselves with an authority. They dominate any environment they inhabit with their silver cords, trails of their prey streaked across their intricate cages of silk. I was armed with a brush and, at first, I was quite comfortable to sweep my way through the maps and mazes the spiders had left behind them. For a moment, I imagined my own house being cast away in this manner and felt guilty, but then powerful again in the next instant. On inspecting the dizzying complexity of the patterns, I pictured myself as a spider knitting an infinite world of webs and trapping enemies to be ingested piece by piece. Littered around the windowsill were the crumpled bodies of spiders whose numbers had come up. Strange, I thought, that something as apparently flimsy as a web could hold firm whilst a creature as feared as a spider would so easily succumb to mortality. All knotted in on themselves, they looked like they were trying to hide from the shame of their defeat. I know that feeling. Just then, there was life. Movement. A spider shocked me as it glided suddenly into view and froze. I thought of myself multiplied in the spider’s vision as it angled to see me more clearly. I was secretly ashamed for feeling fear in the face of this tiny creature. What did I imagine it could do to me? The shock in my chest subsided but now I felt reluctant to continue sweeping away the cobwebs in its presence. You might think it ridiculous but I was flooded by guilt at the idea of destroying the networks of web created by this spider and its ancestors as it watched. As if rushing to protect the web from the thoughts in my head, life burst through the spider and it suddenly shot across the cord towards the centre of the web. My shame turned to horror as I registered the unfortunate victim suspended in the middle with its arms and legs paralysed and pinned. It was me and it was not me. Every detail reflected me exactly in a tiny replica. The proportions of my body and the trapped creature were the same but in absolute miniature. Looking upon its face was like gazing into a mirror through the wrong end of a telescope. I saw its arms and legs strain against the hold of the web and the exasperation creep over its face as it realised the futility of fighting against its inevitable fate. It knew it would die here in the terrible grip of a spider. Grotesque images invaded every corner of my imagination as I pictured myself held captive in its chelicerae before disappearing into its shocking mouth, head first, feet kicking ridiculously. The panic forced my hand as I smashed at the web in helpless desperation to free myself from the enemy. I vibrated with animal fury, striking out over and over. Finally I stopped frozen in a gasp as I looked down at my web-covered fingers, outstretched like they were afraid to be seen together in their guilt. I could see no sign of my enemy, presumably thrown into a far corner of the shed, definitely no longer a threat. But I couldn’t see my small self either. My eyes scattered around the windowsill, scanning for movement amongst the dust and dead spiders. There was no sign of him. My memory was a freeze-frame of the panicked expression on the face of the little me. What had I done? In my rage, what had I done? Sickened by my actions and disturbed by the thought of myself – my small self – lost somewhere, tiny and vulnerable, I returned to the house. She could tell right away that something was wrong and I am a hopeless liar, even when lying is the right thing to do. “You’re acting weird,” she said. Now I don’t know about you but when someone says I’m acting weird, I find it impossible to act normally and overcompensate or try to laugh it off. I picked up a letter from the kitchen work surface and examined it without the composure to actually take in any of the words. I was acting weird. Eventually, she gave up on enquiring further, probably deciding that she didn’t care much about my strange mood as there were other, more important matters in need of attention. She left me alone in the kitchen, still holding the letter, still unable to read a word of it. The face of the little me was frozen there inside my head, an image of utter terror. Now when I rescue spiders from my house, I talk to them on the way out the door. It’s okay, I say, I’m not like the others.